Feel even cosier at home with these gorgeous fairy light designs on your wall! With our free printable template and the Pick n’ Mix patterns, it couldn’t be simpler to decorate your house with little cost! 1.Print off the free Fairy light template. We have given you a large and smaller shaped template to alternate your design. Pick which paper designs you would like to use in the First Edition Pick n’ Mix paper pad. 2.Draw around the fairy light template onto the back of your chosen Pick n’ Mix sheet and cut out. 3.Vary your design by picking a different Pick n’ Mix paper for each light and using the different sized templates. 4.Lay your Pick n’ Mix Fairy light template flat onto your die cutting plate. Layer the small heart from the First Edition wedding dies on top of one side of your fairy light template and die cut. Repeat this on the other heart shape so that you are left with a diecut on both the front and back of your design. 5.For each light we have alternated the design by diecutting a heart and butterfly from the First Edition Butterflies die collection. It is up to you which die you’d like to use on your design! 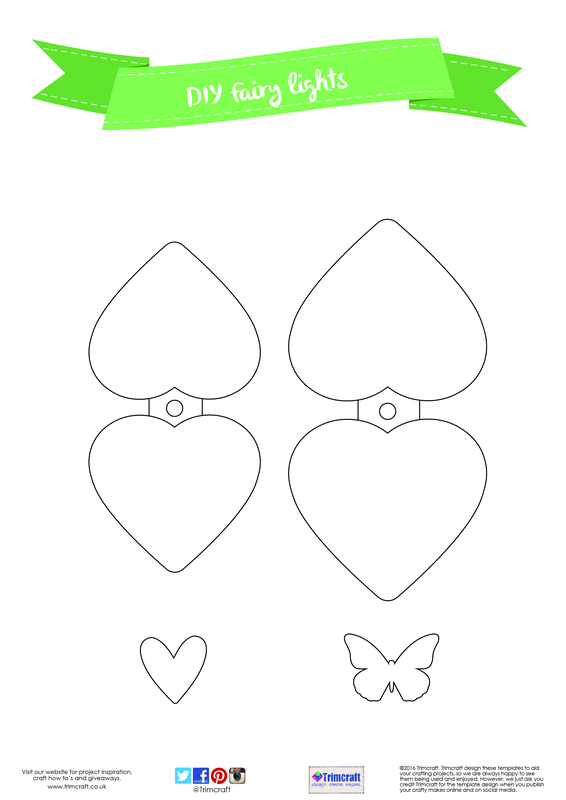 6.If you don’t have the First Edition dies, cut out the butterfly and heart from our template, draw it around onto your fairy light and template and cut it out with a craft knife. 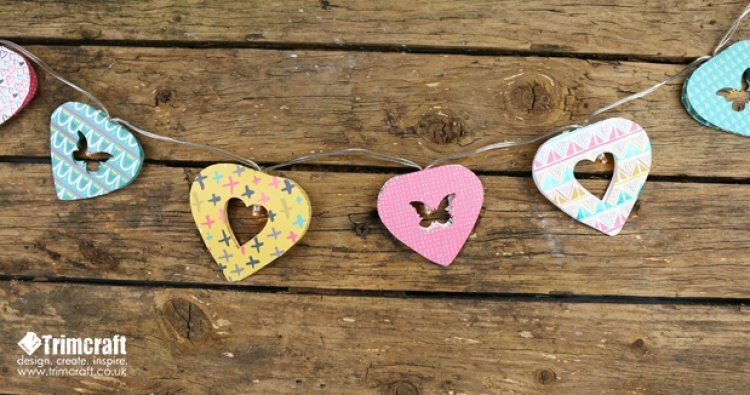 7.Once you’ve finish diecutting each heart shape, punch out the hole that is indicated on the template to thread your lights onto. 8.Thread a light through each individual Pick n’ Mix template. Add a small strip of Dovecraft Perma Fix tape to the bottom of each heart to connect the two sides; this will also give you a 3D effect! We love this pretty, fairy light template and with the variety of First Edition paper designs to choose from, you’ll be sorted for decorating for a range of occasions! What paper design will you use on your fairy lights? Remember to upload your gorgeous makes to the inspiration area and to #Trimcraft when uploading on Social media!